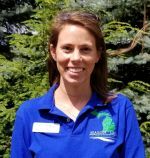 Dani joined the Mason-Lake Conservation District at the end of 2015 and transitioned to the District Manager position in 2017. In her capacity as Manager, she collaborates with partner organizations and local landowners to complete conservation activities in our community. This may happen through collaboration on grant applications, linking landowners with the appropriate technical experts (on staff or elsewhere) and promoting existing programs for funding conservation projects. Dani came to the District with experience in habitat restoration and invasive species management. She has a Bachelor's of Science in Biology from Michigan Tech University and a Master's of Science in Natural Resources from the University of Michigan.